Scoop the ice cream into a round cookie cutter placed on a plate. Smooth the top with the back of the ice cream scoop so you have a flat disc. Repeat for each sandwich. Transfer to the freezer and freeze until solid, approx. 2 hours. Using the same cookie cutter, cut four equal rounds from the brioche. Save the extra to eat or for another dish. When the ice cream rounds are solid, heat a frying pan and toast the brioche rounds until golden brown. Transfer to a plate, spread strawberry jam onto half of the brioche rounds, top with the ice cream rounds, and cover with remaining brioche slices. 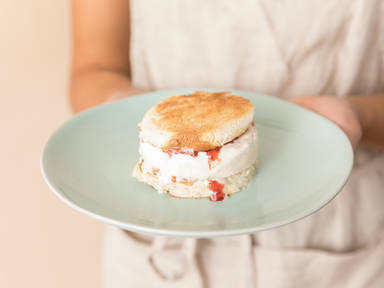 Serve the ice cream sandwich news immediately and enjoy!